There are many exotic-looking insect species that you can immediately recognize. Although they use camouflage, Guanacaste walking stick insects are easily spotted at night on low shrubs. The three inch rhinoceros beetle has an unmistakable long, upward curving horn on its head. 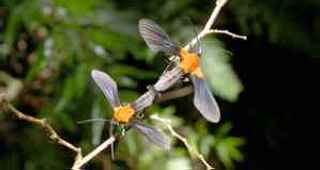 Some brightly colored insects even double themselves up at the base of leafstalks, so as to mimic or resemble flowerbuds, and thus deceive other insects on which they prey. The long history of the rainforest has enabled countless butterflies, moths, ants, termites, wasps, bees, and other unique tropical insects to evolve in astounding profusion. There are many thousands of ant species alone. The insect biodiversity in Corcovado National Park includes at least 220 species of breeding butterflies, plus others that are migratory, simply passing through.